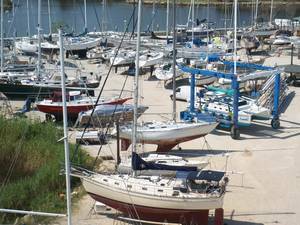 Turner Marine Supply, Inc. is the largest marina and repair facility dedicated to sailing vessels and power boats on the Gulf Coast. In the past we have been known for our complete repair of Catalina, Island Packet, Hunter, Beneteau and all sailing vessels from factory warranty, hurricane damage repair and complete restoration. Today we are proud to say we work and specialize in all boats; trawler, sportfish, yachts and sailboats. Our technicians are Raymarine certified and Turner Marine is a certified Raymarine dealer. Haulout-out and in......................................$7.00 per boat ft.
Pressure wash...........................................$2.00 per boat ft.
Holding Boat in Slings.....................................$50.00 per hr. Specialty labor rate..........................$90.00 per hr. Standard yard labor rate...............................$75.00 per hr. We have a do-it-yourself yard for owners to do their own work. Special rules and regulations apply. Please contact the office for more information and availability.